Plain weave is the most common and tightest of basic weave structures in which the filling threads pass over and under successive warp threads and repeat the same pattern with alternate threads in the following row, producing a chequered surface. They do not ravel easily but tend to wrinkle and have less absorbency than other weaves. The plain weave is variously known as Calico or Tabby weave. It is the simplest of all weaves having a repeat size of 2. The threads interlace on an alternate order of 1 up and 1 down. Cloth thickness and mass per unit area are limited. It produces a relatively stronger fabric that is obtained by any other simple combination of threads, excepting that of “gauze” or “cross weaving”. The principle involved in the construction of plain cloth is the inter-lacement of any two continuous threads either warp or weft in an exactly contrary manner to each other, with every thread in each series passing alternately under and over consecutive threads of other series interlaces uniformly throughout the fabric. By this plan of interlacement, every thread in each series interlaces with every thread in the other series to the maximum extent, thereby producing a comparatively firm and strong texture of cloth. A complete unit of the plain weave occupies only two warp threads and two picks of weft which is the design for that weave. The firmness of any woven structure depends on the frequency of interlacing between the warp and weft threads. The greater the number of intersections the better will be the firmness of the cloth. 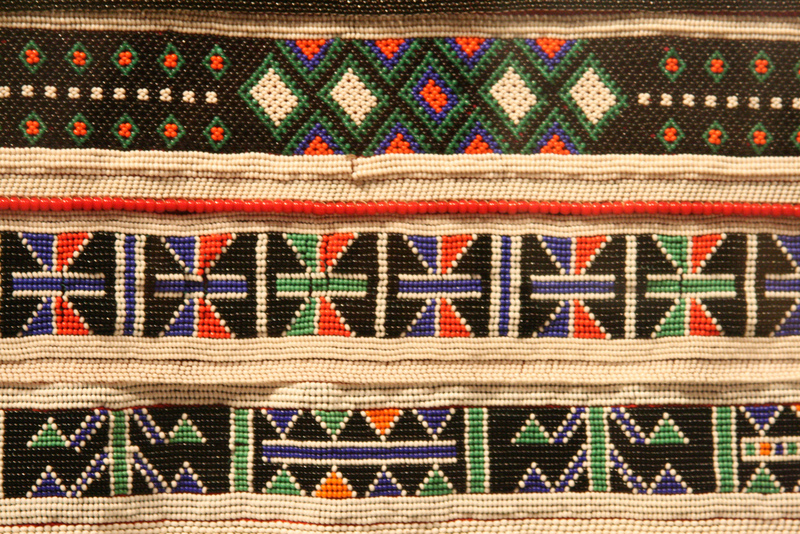 Let us consider the case of two fabrics woven with identical warp and weft counts and thread settings. Consider that one is woven as plain weave and the other with any other weave such as twill, sateen etc. It will be seen that the latter will be less firm, and therefore of weaker texture than the former, because the threads composing it would be bent in a lesser degree than those of the plain weave, thereby causing them to be less firmly compacted. Thus it is important that the counts of warp and weft, the number of warp threads and picks per inch, and the weave, should be properly proportioned, in order to obtain the best results. The plain weave is produced in a variety of forms and textures, possessing totally different characteristics, which adapt it for specific purposes. By causing a differential tension between the warp threads during weaving. By using warp and weft yarns of different counts in the same fabric, The term ‘texture’ is related to the type of material, counts of yarn, the relative density of threads, weight, bulk, feel during handle, and other properties. The range of textures produced in plain cloth is wide. An ideal plain cloth is one which has identical or similar warp and weft constructional parameters. Plain weave finds extensive uses. It is used in cambric, muslin, blanket, canvas, dhothi, saree, shirting, suiting, etc. The plain weave may be modified by extending it warp or weft way or both. The extension of the plain weave thus produces a rib effect. A warp rib results from extending the plain weave in the warp direction and a weft rib structure results from extending the plain weave in the weft direction. A matt rib results from extending the plain weave in both directions. These are produced by extending the plain weave in warp wary direction. The figure shows the warp rib weaves constructed on the regular and irregular basis. At A, B and C have seen regular warp rib weaves and at D, is shown the irregular warp rib weave. E and F show the interlacing of D and A respectively. 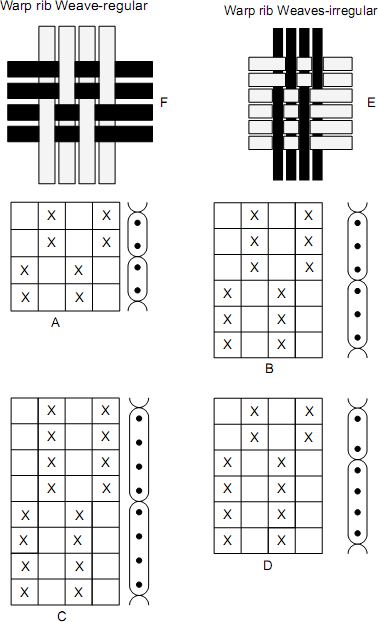 These are constructed by extending the plain weave in the weft direction in both the warp and weft rib weaves, the appearance of the cloth depends on the respective thread settings, and to achieve good effects, it is necessary to weave a weft rib with a high number of picks per inch and a comparatively low number of ends per inch. Similarly, the warp rib effect can be enhanced with a high number of ends per inch and a comparatively low number of picks per inch. The prominence of the rib can be increased by suitable use of coarse and fine yarns. The dependence of all rib constructions upon the correct thread settings is marked. Rib weaves are used in gross grain cloths, matelasse fabrics, repp cloth which is extensively employed for window blinds in railway carriages and other vehicles, upholstering furniture, and cambric pocket handkerchief. These weaves are also variously known as hopsack or basket weaves. The matt rib structures result from extending the plain weave in both directions. In case of regular matt weave, the plain weaves are extended equally in the warp and weft directions, whereas in case of irregular matt weaves, the plain weave is extended unevenly or irregularly in the warp and weft directions. Matt weave finds extensive uses for a great variety of fabrics such as dress materials, shirting, sailcloth, duck cloth etc.